There are many beautiful parks in London, but this is the first and only one that floats. 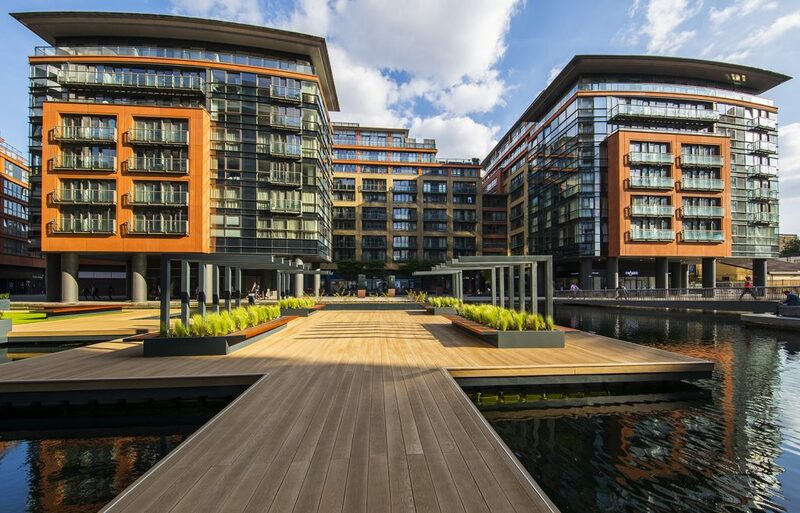 Designed by Tony Woods Director of Garden Club London, this exciting new park in Merchant Square Grand Union Canal, Paddington basin has planning permission for 5 years. Comprised of three separate islands, two of which are connected by a walkway, the park transforms an urban area into a stunning green space – a place for people to relax, unwind and enjoy. The third and separate 12 metre by 3.3 metre pontoon is for wildlife use only, built to infuse nature into the area by encouraging wild fowl and other ground nesting birds to roost. This was accomplished with specific planting and adding a duck ramp to the side of the pontoon. During the build of the park cormorants, swans, coots, wagtails, pike and a family of ducks with 11 ducklings all became very interested in the new project. 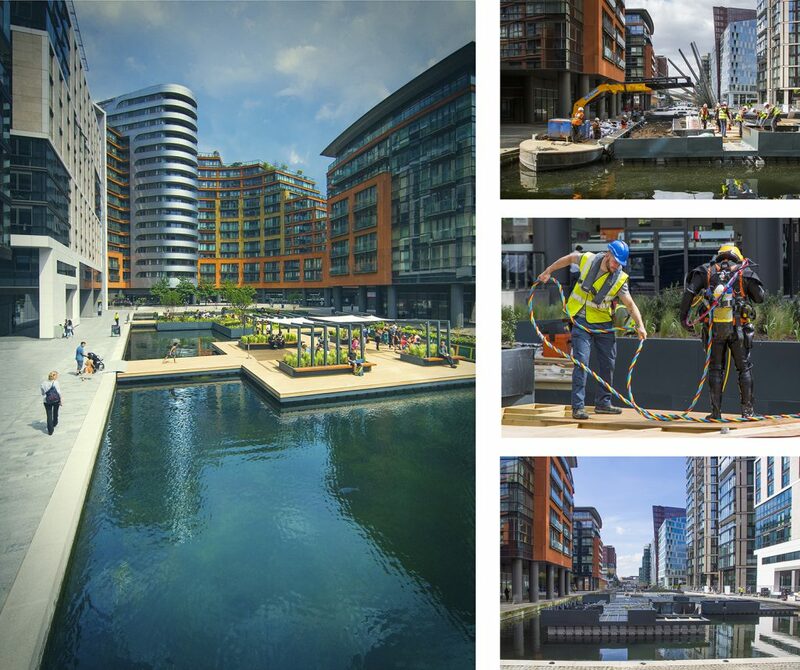 Complementing the award winning Fan Bridge and the water and light fountain of Merchant Square – the 730 square metres of park brings a new lease of life to Paddington basin. With the capacity for 100 visitors at any one time, residents can enjoy free wifi, coffee and snacks from barges offering café style facilities. The platform of the pontoon was constructed over a two week period using interlocking modules made from recycled plastic to make the base of the floating park. Under the guidance of a marine engineer, divers then added further modules in those areas that were to hold more weight, the pontoon was then anchored down to ensure it stayed in place. ‘Health and Safety was very different to our usual site work’ said John Wilkes Director of Europlanters ‘On this project we needed to wear life jackets over our hiviz vests and bump hats instead of our usual hard hats. All tools needed to be attached with lanyards to ensure that they didn’t fall to the bottom of the canal’. 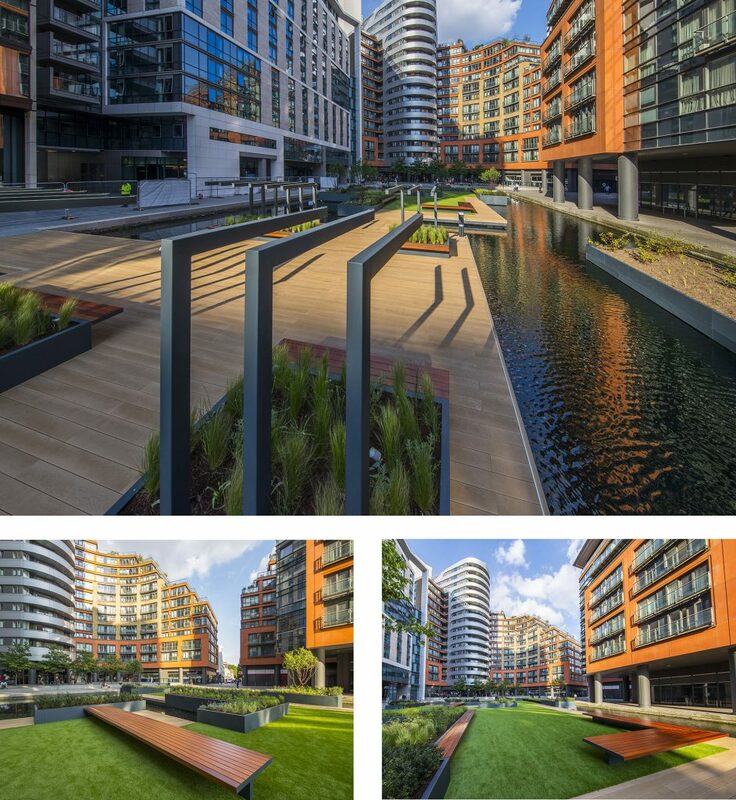 Europlanters installed 100 planters in RAL 7026 creating 214 square metres of planting space for trees and soft planting and fitted 58 Meters of Sapele hardwood seats to create communal seating areas, all having stainless steel brackets and legs to support them. 18 sail supports were also fitted into some of the planters to create shaded areas for people to sit. ‘During the installation we needed to ensure that we protected the environment’ said John, ‘so a 110V vacuum cleaner was used to prevent any dust or fibres going into the canal whilst fitting’. Multi-stemmed Tibetan Cherry trees were anchored down into the planters with guy wires fitted into the planters and were surrounded by soft planting such as mixed grasses, Lavender and Alliums. The park also has a large artificial lawned area. ‘This was perhaps the most demanding installation we’ve ever done and it didn’t come without its challenges, but it was by far one of the most exciting projects that we have been involved with’ said Julie Wilkes Director of Europlanters. The Europlanters team came on board at the end of March 2017 to start fitting almost 200 metres of fibre glass fenders to the pontoon. This was not without its challenges, as the pontoon was continually moving and listing because of the uneven weight distribution at the start of the project . The planters were then installed, and soil was used to level out the platform. It was exceptionally difficult fitting the empty planters to an uneven surface at the start, but the beauty of fibre glass is that it’s flexible when required. It was all hands on deck when the soil arrived. There were two deliveries; the first was for 48 tonnes and the second, 47 tonnes. These arrived via bags on a canal barge with a Hiab crane. Each bag was strategically placed on the pontoon to ensure the platform remained as level as possible during the unloading stage.To continue to level out the pontoon after the weight of soil was distributed, a team of 5 divers added more plastic modules underneath the relevant areas. The divers worked in 4 hour sessions with a ‘buddy’ on stand by and others communicating and guiding the divers into position.